"A leading church minister claims witchcraft is being practised in areas of West Wales," starts a news story on This Is South Wales. Well, I'm sure it is, witchcraft is practised all over the UK these days and is growing in popularity, but not the kind of witchcraft the minister in question is talking about, I would say. 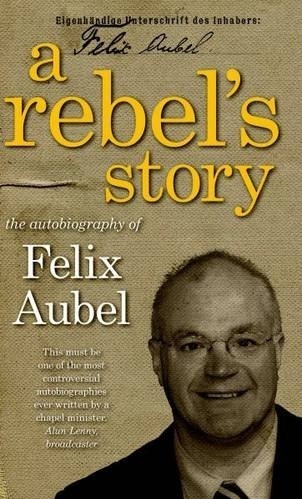 The news story is actually about the memoirs that have just been published by a vicar, Felix Aubel, from Wales. The book is called A Rebel's Story. Dr Aubel revealed how a curse on a parishioner had to be lifted by an exorcist. He said: "What I would refer to as the occult is something I have encountered during my time in Aberaeron as part of the Welsh Congregational Chapels and also the past 13 years in Trelech. "Occult activity is evident in equal measure in both areas I would say." The book refers to people in West Wales using effigies to try and bring bad luck to other people. In the book he states: "It was this evil type of poppet that was used on a chapel member of mine in the Aberaeron area in 1994. "It took an experienced Anglican exorcist to 'raise' this curse, which had been placed by a witch on the instruction of another former church member. The motivation behind this 'evil' was envy that had turned into jealousy. Enmity then evolved into paranoid hatred that was exploited financially by a witch." Now, as I am sure any modern pagan will know, most witches nowadays - particularly those following Wiccan-style practices - very rarely cast curses. Most believe that it is wrong to curse. Not only is it antisocial, there is a strong chance the curse could rebound on the caster. However, historically, there is ample evidence that cursing took place in the past - and all sorts of people used this kind of folk magic, Christians as well as pagans, witches and non-witches alike. You can read more about this in my review of an excellent book about curses, By Spellbook and Candle by Melusine Draco. I think it is quite possible that Dr Aubel did come across an example or two of cursing during his 20 years as a vicar. And, let's face it, an account like that is a jolly sensational addition to his memoirs. However, I don't think this makes Dr Aubel anything of an expert on the occult or on what witches normally do. If you think about it, although it is quite likely that a parishioner would go to their vicar if they feared they had been cursed, no one is likely to run to tell the vicar that a witch had done healing magic for them, or that a witch had successfully predicted a good turn of luck ahead, or had helped them find something they had lost by dowsing for it. So, vicars get to hear about rare bad stuff, but not all the nice things witches do. A very one-sided account. I haven't read A Rebel's Story, I'd probably read it if I got sent a review copy, but I would suggest that Dr Aubel come along to a pagan open event to find out what the growing number of witches in Wales really get up to. He might become more of an expert on the subject if he did.